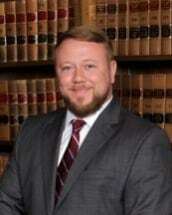 Aaron L. Bell joined the Law Firm of Thigpen & Jenkins in 2007. Since that time, Aaron has devoted the majority of his practice to family law, but has successfully represented clients in general civil litigation matters as well. Aaron practices in a variety of family law issues, including establishment and modification of child custody, child support, spousal support, divorce, property distribution, domestic violence and negotiation of separation agreements. With his primary office located in Southern Pines, just minutes away from Ft. Bragg, Aaron has also represented many clients in military divorce law. Whether your case can be settled by agreement or requires litigation, Aaron’s analytical and negotiation skills will be incorporated into your case strategy to maximize its outcome. Recognizing that his clients are at a turning point in their lives, Aaron aims to build relationships of trust based on openness, accessibility, and detailed knowledge of each client’s unique situation. Aaron enjoys helping his clients create a new future in the wake of challenging life transitions as he provides counsel and support during those difficult times. Our five attorneys utilize a team approach for all of our clients ensuring that even if Aaron is in trial, there will always be an experienced attorney available to provide you with immediate assistance. Aaron practices primarily in NC Judicial District 19B which includes Moore, Montgomery and Randolph Counties; however, he has experience settling and litigating cases in Chatham, Hoke, Lee, Richmond, Scotland, and Stanley Counties as well. A third generation Moore County native, Aaron has extensive ties to this community. Being a dedicated husband and proud father provides Aaron special insight into family law matters and the effect of a parent’s influence on a child’s life. When not practicing law, Aaron enjoys spending quality time with his family and friends, following the latest issues of political debate, participating in various outdoor activities, expanding his extensive comic book collection, traveling and jamming out to his favorite music. Guest Lecturer for Moore County Parenting Under Two Roofs regarding the financial and legal issues involved with child custody and child support cases in North Carolina.